Eight years ago today, July 7, 2007, I made my solemn vows. In some ways it seems like just yesterday, in other ways it seems like a lifetime ago. Time is funny, it seems to move slowly and quickly at the same time. The holy cards I made to remember the day bore the above image, along with this prayer, one of my favorites. I had kind of forgotten about it until I was cleaning out a drawer and found a stack of my old holy cards. 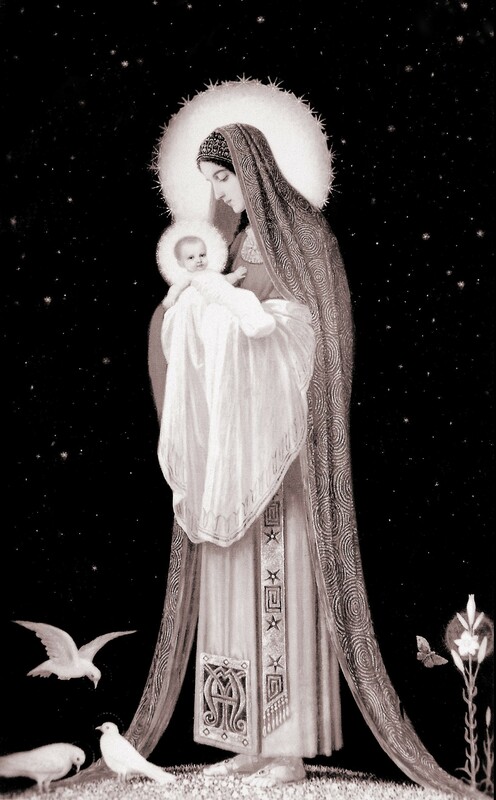 I don’t know anything about this image of Our Lady and the Infant Jesus. Sr. Grace Marie had it in her stash of religious art for making vow cards, and I have tried to find it elsewhere to learn something about it, but with no luck. We had the best artwork in the monastery, and when I try to find it online I never can. I don’t know the source of the prayer, either. I came across it in one of the sister’s prayer books, and I’ve tried to find it online but to no avail. It pretty much says it all, what we religious, and all Catholics, should be striving for: a pure heart that pours itself out like a libation for God. O Holy Virgin, keep my heart as that of a child: pure, fresh and wide and glad, transparent as a spring. Give me a simple heart which will not retire within itself to savor its own sorrows; a heart magnanimous in giving itself, easily moved to compassion; a faithful, generous heart which does not forget any favor received, nor hold resentment for any injuries done to it. Make my heart meek and humble, quick to forgive, and capable of bearing tranquilly all opposition; a heart which will love without expecting love in return, content to vanish in the hearts of others, sacrificing itself before the Presence of Thy Divine Son; a great and indomitable heart, that no ingratitude can close and no indifference weary; a heart tormented by the glory of Jesus Christ, wounded by His Love, with a wound that cannot be healed except in Heaven. This entry was posted in A Nun's Life by srelizabeth. Bookmark the permalink. Thank you so much for your fiat to God’s call. You’re a great gift to us all!!! The prayers are probably copies, and have yet to be scanned and posted onto the internet?? Wow, can i have a prayer card Sister? Happy Anniversary of your Vow day Sr. Elizabeth! Attributed to Leonce de Grandmaison, S.J. So much to read, so little time! Thank you for responding to God’s call. You are a gift to us. Congrats and Happy Vow Day, Sr. Elizabeth. God Bless!!!!!!! This is really weird…I’ve been thinking about you and your solemn profession since I got up this morning with absolutely no memory of the actual date. The only thing I remember about the date was the heavy rain and humidity. Wow, times really flies these days. God was trying to tell you to pray for me 🙂 Your memory is better than mine – I wouldn’t remember the weather that day, except I have the pictures of my family with umbrellas in the piazza to prove that it was raining.